The number of eels in the Thames and its tributaries has dropped by 98% in five years, say scientists from the Zoological Society of London. The quantity caught in special test traps (and later released) nosedived from 1500 in 2005 to just 50 last year. The reasons are — how else could we put this? — slippery. 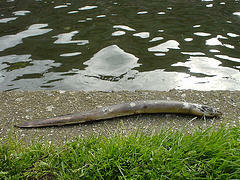 Thames eels enjoy the most remarkable of commutes. Fresh larvae (called leptocephali, fact fans) swim all the way here from the Sargasso Sea (which, as those same fact fans will tell you, is an area of the North Atlantic Ocean). After two decades frolicking in the waters of London, they head back to the Sargasso to spawn the next generation. Researchers are not sure whether the plummeting numbers in the Thames are due to fewer eels making this 4000-mile voyage, or whether there's some kind of problem with our waterways. (A third theory, involving edacious Cockneys, has not been explored.) The diminution could have knock on effects for waterfowl and other predators who rely on the squirmsome fish. Image and caption by Diamond Geezer under a Creative Commons license.